What innovations drive success in healthcare? Here’s a tactic from a leading healthcare organization on the athenahealth network. Highland Hospital, a public hospital in the Alameda Health System that serves all of Alameda County, California, is located in what most would consider a food desert – far from a grocery store or farmers market, with most nearby residents largely reliant on corner stores. The county has a food insecurity rate of 14.3 percent, higher than the national average of 12 percent, a concern when research shows that food insecurity is associated with chronic health problems and health disparities. Highland patients were frequently advised to change their diets to incorporate more fresh fruits and vegetables, but accessibility and price presented almost insurmountable obstacles. Highland Hospital partnered with Mandela MarketPlace, an Oakland, California-based nonprofit organization working to build community-owned food systems. First, Mandela opened a weekly produce stand selling sustainably-sourced produce directly in front of the hospital. Through its Fresh Creds program, customers using electronic benefits transfer (EBT) to buy fresh fruits and vegetables receive a 50 percent discount, funded through federal nutrition incentives. 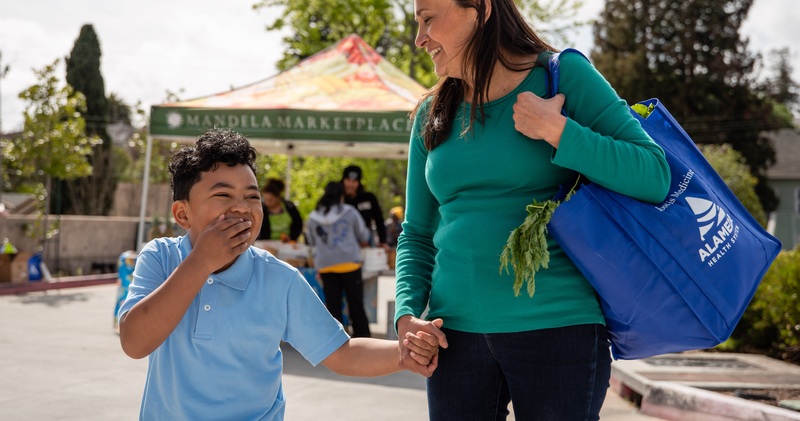 Next, Mandela partnered with nearby corner stores where patients shop to begin selling Mandela-sourced fruits and vegetables, offering the neighborhood healthier food options. Mandela’s Community Nutrition Educator rotates through all the stores to provide health education including nutrition information, cooking demos, and fun exercises to get kids moving. Each event always includes a tasting of healthy food. “Having people taste the food is a really meaningful and transformative part of the program. It makes its own case,” says Chelsea Sarg, coordinator for Mandela MarketPlace’s Retail Incentive Program. Lastly, Highland and Mandela started a pilot study called “Bite to Balance” or B2B, targeting patients struggling with obesity, excess weight, diabetes, or pre-diabetes. Primary care and pediatricians referred patients directly to the produce stand as well as enrolling them in a 12-week hands-on nutrition and cooking class at the hospital. Patients often complained that “they had no idea how to use all the ingredients they were now supposed to include in their diets,” explains Sarg. Community classes both help people learn how to cook fresh produce and serve as a support group for people trying to make changes in their lifestyles. The produce stand sells some 200 pounds of produce to an average of 50 customers each week. And participants in the B2B pilot program exhibited lower serum markers for obesity, increased patient engagement (71 percent completed the 12-week program), and reduced healthcare costs. And surveys show all patients who shop at the produce stand and participating stores now spend more of their food budget on fruits and vegetables, sharing that the 50 percent discount made all the difference. Edited on June 21, 2018.